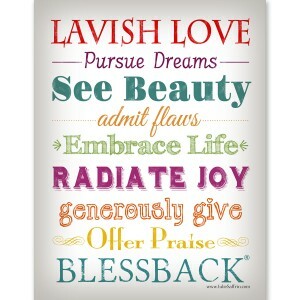 A BlessBack®* is an expression of thanks given to those in your past who have had a positive influence in your life. It is an exchange of blessing between two parties: the giver and the receiver. As you live the BlessBack life, you will discover that at various times you may be a giver and at other times a receiver; sometimes you may experience both giving and receiving at the same time. BlessBacks are different from random acts of kindness. Most often, a random act of kindness is being kind to someone in a spontaneous way. 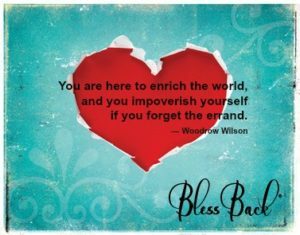 A BlessBack, on the other hand, can certainly be spontaneous in its delivery, but its intent is to specifically direct and give a blessing to someone in your past who was or is significant to you. A BlessBack has two parts. The first part asks you to examine your life — from as long ago as when you were a child to as recently as yesterday — and look for the people who are or were a positive influence. The second part involves connecting with these influential people to give your thanks, and telling them specifically how they made your life better. Instead of paying kindnesses you’ve received forward, a BlessBack pays your thanks backward to the people who made a difference in your life. I call these people “points-of-light people” because an element of their attitude, personality, or character affected you in such a way as to stay in your memory. Points-of-light people may be someone who changed your day, your year, or even your life. When my son Jake was ten, he had a homework assignment to write a thank-you letter to a military veteran. He wrote a relative who, in 1968, enlisted into the Marines. Thank you very much for your service to our country as a marine during the Vietnam War. Happy Veteran’s Day! A reply came two weeks later. Thank you very much for your nice note. No one has ever thanked me for my service to our country. Thanks for writing. Hope to see you and your family soon. Who are those people who have had an impact on you? Send them a BlessBack. Doing so will make you feel amazing. 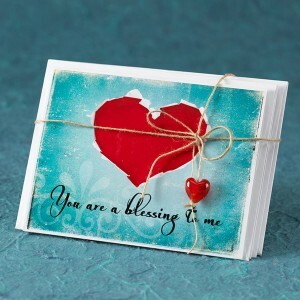 BlessBack “You are a blessing to me” Notecards. 5 for $10 in the shop! 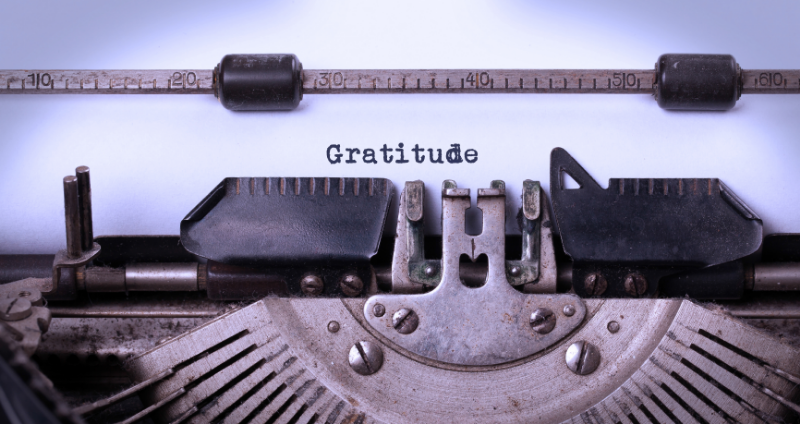 There truly is real power – the power of gratitude – as those scientists in the positive psychology field have shown us, when we put our feelings of thanks down on paper and send our thanks into the world. Our actions are motivational, both in self-help, but also, we help others and are making a difference in the world. And most importantly of all, giving a BlessBack may very well change your recipients’ lives in that it will validate who they are as a person. Thanks so much for leaving a comment, Barb. Your story, which is in the book, about your friend who helped you become a cheerleader, is so inspiring and shows the wonderful things thirteen-year-olds can do for one another. I am so glad you took the time to thank your friend!